Breaking News: IT’S CURRENTLY LESS THAN 48 HOURS TILL THE FOOD SHOW (actually it already started today, but I’m going on Sunday, and I’m hopeless at maths and can’t actually figure out specifically how much less than 48 hours it is away so…momentum sustained!) I have blog business cards at the ready and my camera batteries charged and once at the event I will blog…hard. We Wellingtonians are lucky folk. Sure, Auckland gets EVERYTHING, but we have Moore Wilson’s food warehouse, which is superior to any food place I’ve ever been. And friend, I have been food places. 1- I made this up on Sunday, so it hasn’t been thoroughly tested or anything. 2- The lamb shanks came in a pack of three, even though lambs have four legs. Can anyone explain this as it has been preventing me from focussing on more important things in life. In a large casserole dish, place two onions, finely sliced, four cloves of garlic, also finely sliced, and two carrots, chopped into batons. On top of this, place your lamb shanks. Pour over 125 mls dry Marsala, 400 mls water, and a tin of chopped tomatoes. Add a couple of bay leaves, place the lid on top, and bake at 160 C for an hour or two. About half an hour before you’re ready to serve, rinse a tin of borlotti beans and add this to the casserole dish, stirring a little. You may need to add a little butter and flour rubbed together to the liquid, which will thicken the sauce as it cooks in the oven. Serve as you like – over rice, couscous, potatoes, or as I did, wet polenta. Is there a word for the moment where you’re stirring your polenta and you taste it to see if it’s done – if all the grit has cooked into delicious softness – and in doing so you burn the roof of your mouth? I bet the Italians have, like, thirty ways to describe this. Above: No false modesty here – these lamb shanks were really good. I don’t think you could go wrong with the ingredients though, so maybe culinary conservativeness on my part was the reason it turned out so well. The meat straddled a pleasing crossroads, being partly melt-off-the-bone tender and partly maintaining enough reassuring ‘bite’ to it, to ensure it didn’t lose its identity in the dish entirely. Marsala is amazing, adding its reliably fabulous flavour to the whole shebang. 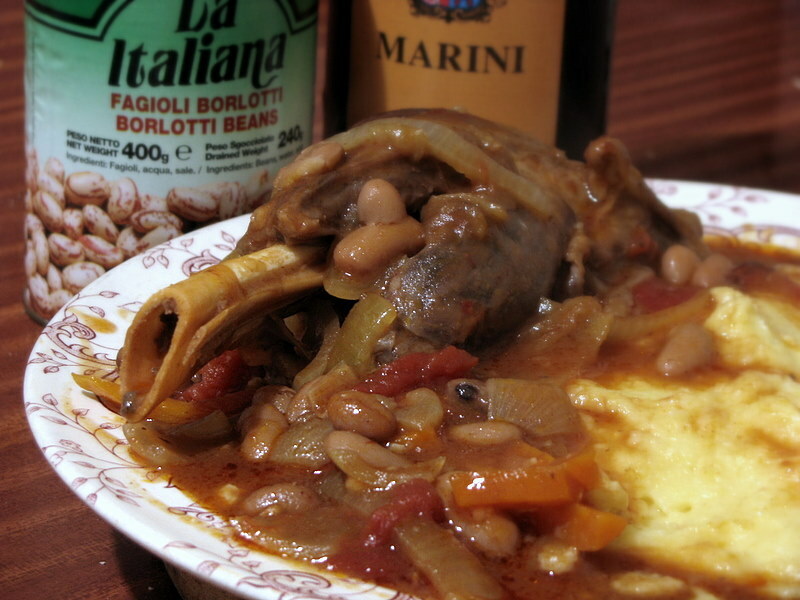 And the borlotti beans held their own, providing an earthy counterpoint to the sweetness of the meaty young shanks and the creaminess of the polenta. By the way, I LOVE polenta. I make it in an unorthodox way (if you’re Italian, cover the eyes of any young children around and avert your own) in that I add the cornmeal to the water while it’s cold, stir till smooth, and then heat that mixture to the boil. It’s just that I haven’t mastered the art of adding the cornmeal to boiling water without it siezing up in unforgiving, solid clumps that will not be whisked out. And there are few things more depressing than lumpy polenta. The next day, inspired by a post on the lovely Sarah’s blog (when I say inspired, I think I read the post around six month ago) I used the leftover lamb shanks in a risotto. I sauteed two chopped onions and a couple of cloves of chopped garlic, then added carnaroli rice (actually I accidentally dropped the bag into the pan, spilling out quite a lot of rice grains. This is not the method I recommend you take. Chronic clumsiness + obscenely expensive artisinal rice = howls of pain). After stirring this for a bit, I poured in a generous slosh of Noilly Prat – from the bottle pictured in my header picture, come to think of it – and then stirred in the tomatoey sauce from the lamb shank dish, and plenty of water, stirring till the rice absorbed it. 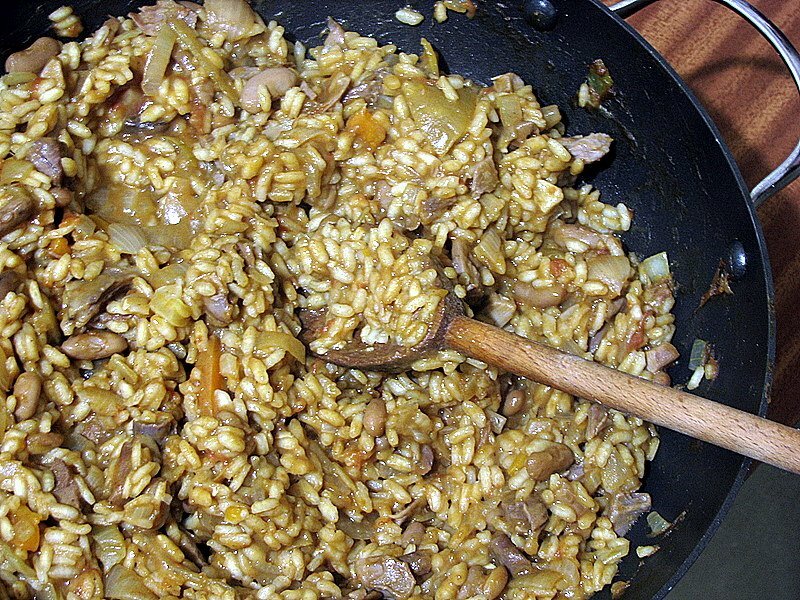 I carried on in this fashion – add liquid, stir, absorb, etc, and then finally chopped up all the remaining meat off the third shank and folded it into the risotto, whose grains of rice had now swollen puffily to absorb the meaty, winy, tomatoey juices. Is there an Italian word for that thing where you eat so much risotto in the process of making it – bearing in mind that you have to stand there stirring it for at least half an hour – that by the time it gets to eating the finished product for dinner you’re not really hungry? From what I nibbled stoveside, it was delicious, a really hearty, wholesome, heftily flavoursome dinner. So thankyou Sarah for the inspiration, now that the opportunity has finally arisen! I should point out that Sarah went on to make leftover leftover-stew-risotto risotto cakes, however I cannot even attempt to achieve those dizzy heights of food recycling. Speaking of Wellington, if you’re ever lurking near the Terrace (ie, the office building hub of the city) I can thoroughly recommend the coffee at Rise, where my work team had a little farewell lunch for a beloved colleage. I hate goodbyes but I loved Rise. The service was impeccable – attentive but not creepy, sassy but not rude. She’s a fine line. The food was excellent, if a little on the expensive side, but you could tell it wasn’t scooped out of a vat out the back (and if it was, they did a fine job of disguising the fact). And, as I said, the coffee – in this case a long black – was perfect. Next time: I’m blogging the Wellington Food Show. Well, someone has to – last year when I did it I got the blankest stares from most of the people running the booths, and I’m endeavouring to change that. It’s nothing heroic, mostly self-promotion, but nevertheless something I feel strongly about. Also I have this urge to make butter from scratch and bought myself a litre of cream with which to do so. Yum yum, I love that risotto! Come to think of it… it’s probably against all food health and safety laws to reheat food 3 times… lol. This looks just delcious! And, I like your style. I’m going to try your polenta method. Thanks! Hope you have a satisfying time at the Food Show, sounds like fun. And yes, what do they do with the fourth lamb shank??? And you are also on the countdown to graduating!! Do you have your gown etc organised, and what colour will it be? Is Tim’s the same colour? 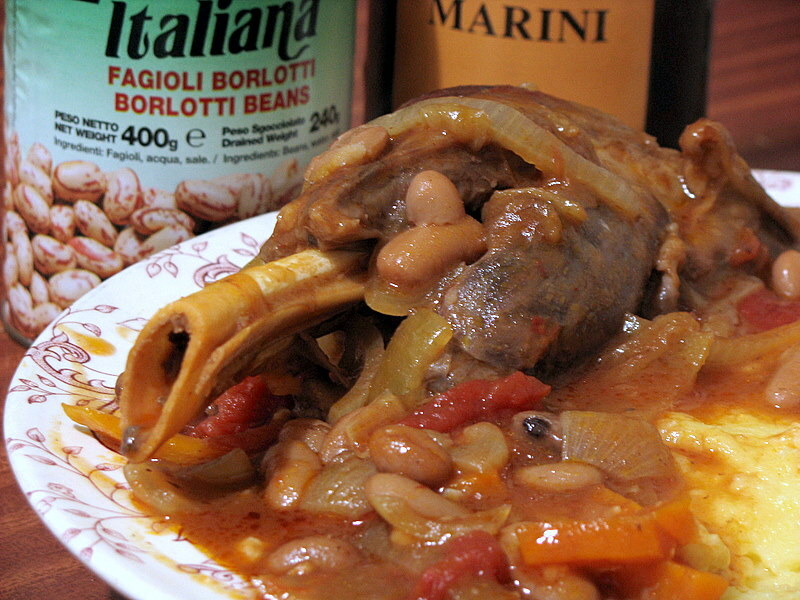 I cooked lamb shanks last week – I should have waited for your recipe. Love the “straddling” vision. I am currently stewing home-grown apples – had a bumper crop this year, making an as-yet-to-be-decided-final-flavour casserole out of meat I found in the freezer, and, a home made vegetable soup. Hopefully that will see us through the week. Hope you enjoy the food show. Good luck with your blog cards. I love how you make me giggle. I bet there is a paddock out there filled with one-legged lambs. hehe quince season was the best! Sorry, I can’t answer the 3 legged lamb question but I,too, make my polenta your way. 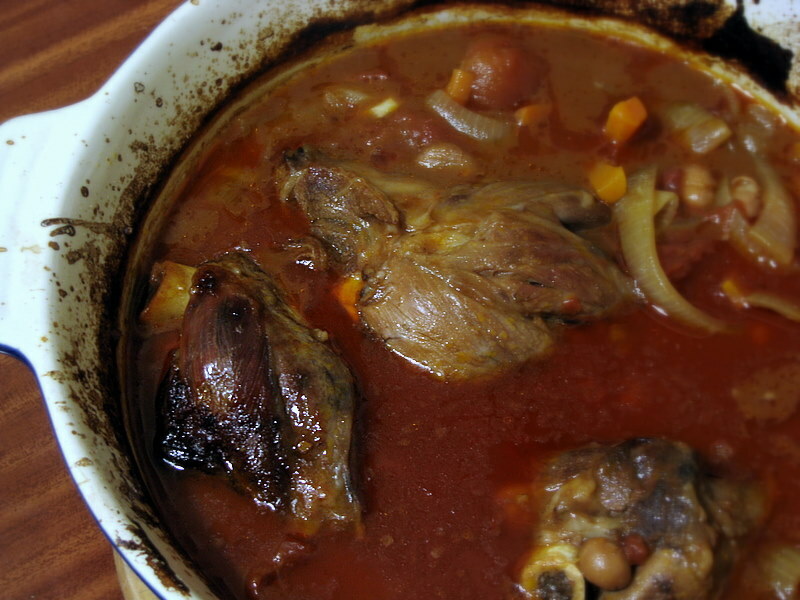 I love lamb shanks and the weather here is telling me I need good hearty home cooking like this. Thanks for sharing. Sarah: Lol I ignored that bit. Thanks for the idea tho! Redmenace: Thanks, and trust me on the polenta, it actually works! Viv: Am really excited about graduation, gown is organised but have no idea when I’ll have time to pick it up…Tim and I are in the same ceremony and I’m guessing they’re the same colour gowns we’ll be wearing. Scott: You make me giggle too, thanks for a choice night last night! Or you could have called it Lambshank Redemption, lol. Glad you liked the pink kitchen items – I particularly liked the measuring spoons having never seen anything like them before. Hope you try the recipe in my latest post – am not trying to go into competition and my photo of said slice has no artistic merit at all but it was too easy to make and like I said, the rolled oats almost make it a health recipe heh, heh. That looks entirely fabulous! Lamb shanks are just amazing. You have blog business cards? I really think I need to do something like that so people understand why I am taking pictures of my dinner.